Increasing violations against indigenous land ownership and protected areas are leading to large-scale deforestation in parts of the Amazon. Porto Velho, Brazil – Protected areas in the Brazilian state of Rondonia are increasingly being encroached upon by developers, farmers, cattle ranchers, miners, fishermen, hunters, illegal loggers…and the list goes on. Even indigenous lands, which are protected under Brazil’s constitution, are also affected. 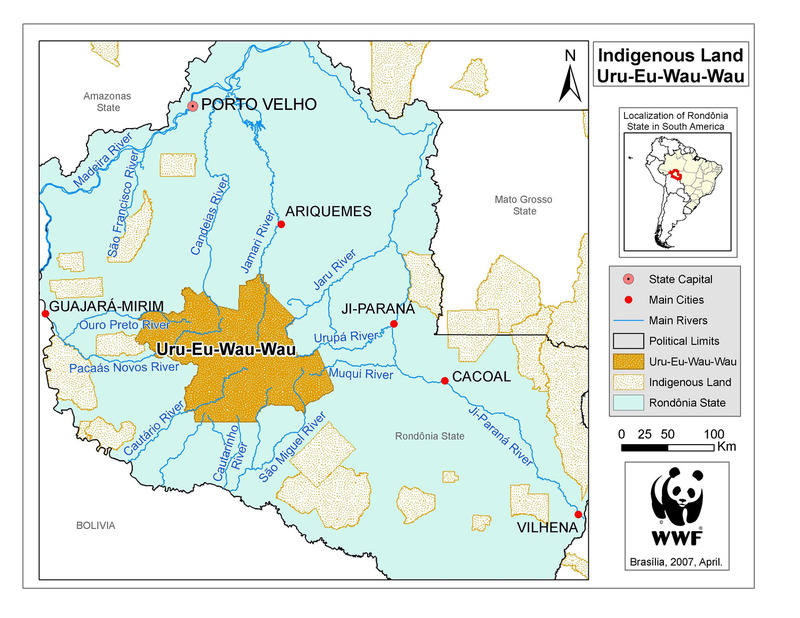 WWF-Brazil’s partner organization, Kanindé, which works with traditional populations, warns that frequent violations to land tenure belonging to the Uru-Eu-Wau-Wau indigenous people, particularly illegal forest activities, are leading to large-scale deforestation. 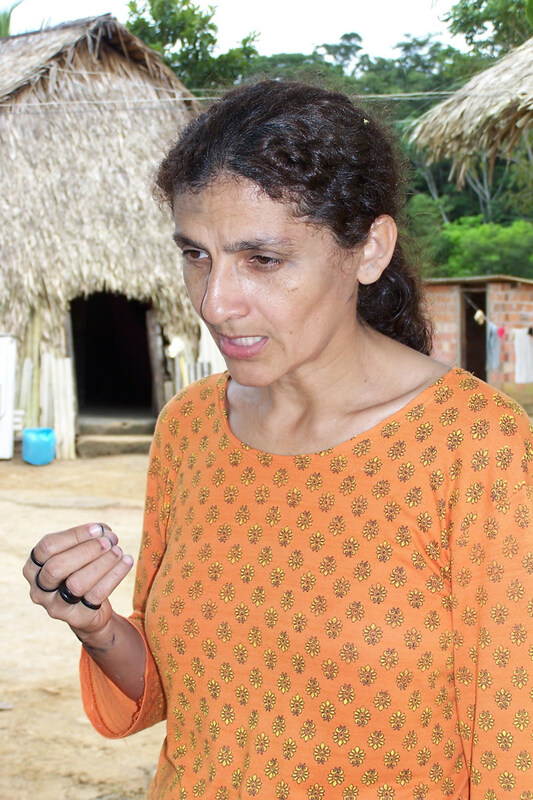 “The authorities have done very little to stop this, exposing indigenous populations to a situation that jeopardizes their existence and being lenient to the devastation of huge forest areas,” stresses Ivaneide Bandeira Cardozo, director of Kanindé. Pacaás Novos National Park — the source of eight major rivers and responsible for most of Rondonia’s water supply — is located within the protected lands of the Uru-Eu-Wau-Wau. The authorities responsible for enforcing environmental legislation point to the lack of financial resources as the main reason for the current situation facing indigenous lands and protected areas. 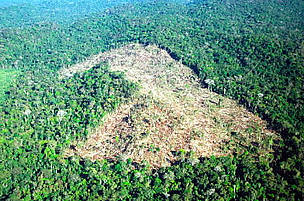 The regional section of Ibama, Brazil’s main environmental agency responsible for the maintenance of Pacaás Novos, still hasn’t been allocated a budget from the federal government for 2007, and the Rondonia State Police environmental unit lacks the troops to carry out field activities and enforcement duties. Working together with indigenous populations and local organizations, WWF is helping to reinforce the protection of conservation areas and traditional territories, particularly through the development of ecological corridors, or the joining of fragmented habitats. “The corridors guarantee the protection of biodiversity and quality of life,” said Claudio Maretti, WWF-Brazil’s conservation director. The Itenez-Mamoré ecologic corridor — running uninterrupted between the state of Rondonia in Brazil across the border into Bolivia and home to 20 indigenous lands and 39 other protected areas — is already at an advanced state of implementation. The indigenous land of the Uru-Eu-Wau-Wau, where at least six indigenous groups live, is located in the heart of the corridor. * By Bruno Taitson, Communications Officer, WWF-Brazil. Aerial view of forest clearing to create grazing pasture for cattle. Amazon, Brazil. The authorities have done very little to stop land tenure violations, exposing indigenous populations to a situation that jeopardizes their existence and being lenient to the devastation of huge forest areas – Ivaneide Bandeira Cardozo, director of Kanindé. 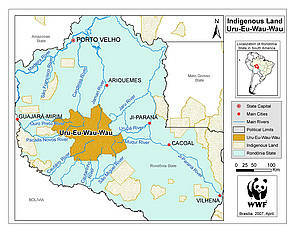 Map of Uru-Eu-Wau-Wau indigenous land.